This is where you earn your reputation. Reason for Beginning: Recommended by Urania of The Egotist’s Club (who kindly bought me the book! ); also the plot sounded interesting. Reason for Finishing: Fast, fun, intriguing read. The character of Gen is the most interesting aspect of the book, but the others don’t disappoint either. The book has a good mix of adventure, humor, and heavier dramatic intrigue, but overall it veers towards “light” adventure rather than a “dark and grim” one. Story Re-readability: Reasonably high, I’d say. I do intend to reread it eventually, to get more of the subtleties and to spot clues regarding the twists in the story, but isn’t exerting as massive a draw on me as, say, McKillip’s Bell at Sealey Head or a Sutcliff book. It’s fast-paced and well-written, though, so a reread should go quickly. Plus, it is entertaining. Author Re-readability: Again, reasonably high. Her style isn’t as immediately impressive as Peter Beagle’s, Rosemary Sutcliff’s, or even Patricia McKillip’s (despite her modesty), but it’s clear, effective, and has more subtleties than you might notice at first. Her great skill seems to be sketching out lively, layered characters, but she can handle world-building, landscapes, and suspense very well, too, as needed. I’m interested in the rest of The Queen’s Thief series, but this book is a complete story in itself and needs no continuation. Recommendation: Sure. It’s suitable for young teenagers but intelligent and entertaining enough for adults, too. It’s good, solid, and very enjoyable. Here’s the book trailer put out by the publishers. Here we have a clever little adventure that manages to provide some genuine surprises even up to the very end. The book’s centerpiece is its protagonist, Gen (short for Eugenides), apparently the greatest thief in the kingdom of Sounis. He narrates the story, and what I find amazing is how well we get to know him without really learning much about him. Oh, we know what he looks like (a short, non-muscular adventure hero! Finally! ), and we become very familiar with his distinct personality. We even hear some stories and memories of his past, although distinguishing between facts and fiction is trickier than you might think at first. He’s a master manipulator, actually. He’s brash, arrogant, and insouciant; but he is also sensible, perceptive, and passionate. He doesn’t care if you call him a coward, because he considers it practical to be afraid of things that can hurt you. He doesn’t mind if you think him weak or spoiled, either—he will complain until he gets the comforts he thinks are reasonable, and satisfies himself with the knowledge that he can always get revenge later. He’s irreverent towards almost everything, especially people with power. Even if you beat him up, he’ll still send back a snarky comment. In short, he should be quite unlikable, but he isn’t. He’s funny, he’s fascinating, and surprisingly sympathetic. We’re allowed to see fairly deeply into his mind, as he seems to hold little back in showing us the world through his eyes. And yet, it is only when we reach the end that we realize how little about him we know. Even as much gets revealed, it is clearly only the tip of an iceberg. I found all of this delightful. Gen is still a hero at the end, but not a typical one. He’s immensely fun to read about, but would probably be a trial to have as a personal friend. ‘Why not?’ I asked again. The world Turner creates in The Thief is deliberately anachronistic. On the one hand, it’s a loose recreation of ancient Greece, with the kingdoms of Sounis, Eddis, and Attolia being about the size of powerful city-states, and the landscape full of sun-baked olive trees, rocky hills, dusty mountains, and a glittering inland sea always on the horizon. The myths of the land also resemble Greek myths of quarreling gods and humans struggling to make their fame without offending heaven. On the other hand, gunpowder, the printing press, and complex locks all make an appearance. In truth, I found this jarring and unnecessary. I will allow Turner the more modern locks so that Gen can do the lockpicking that is expected of him, but the presence of gunpowder is too inconsequential to the story, and too radical a technology for the setting, that I didn’t feel it had a reason to be there. It felt like an arbitrary anachronism. It doesn’t really hurt the story, per se, it just feels gratuitous, in a story that is otherwise very streamlined. Her prose, as I said above, is clear and suitable for the story. There are a few sections where characters tell each other myths about the gods of the land, and Turner writes well in that sparse, casual style so common to the most fantastic tales of old. She’s created her own mythology, but wisely shows off only those elements of relevance to her story. We get the feel of a real world, without being overburdened with superfluous names and details. 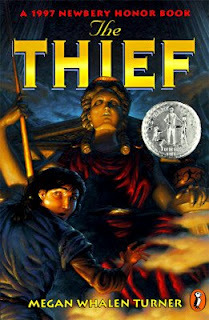 The Thief is an entertaining, skillfully-plotted book, with twists and turns you aren’t even aware of until they’re past, and an ending that ties everything up (or almost everything) in a satisfactory, enlightening package. That even the plot twists deepen our perceptions of the characters says much for Turner’s ability to write lively, multi-faceted personalities. Try it out for yourself.